This is a pair of new replacement standard rear interior trim panels for use on 1968 Camaro with standard interior and COVERTIBLE models only. Units are available in 5 different factory colors and these are the PRE-assembled version which does include the chrome like molding. Use the drop down menu to select the color you need. Dielectrically Sealed With Stitch bar. 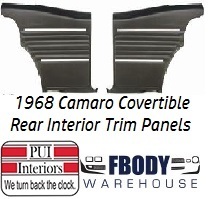 This is a pair of new replacement standard rear interior trim panels for use on 1968 Camaro with standard interior and CONVERTIBLE models only. Replacing these units is a snap at home and really improves the look and value of your 1968 Camaro! Units can ship to the USA and Canada only. Note Canadian Shipping Charge does apply. Use the drop down menu below for Canadian orders. Note: While most soft products ship quickly there can be upto a 4 week waiting period from the time of order to delivery depending on inventory on shelf and production schedule.